In my first post about the Red Sox off-season outlook I talked about the BoSox possibly chasing after soon-to-be big name free agent, Texas Rangers Outfielder, Josh Hamilton. This time around I’d like to talk about a position that will hopefully have opposing batters chasing fastballs and breaking balls for consistent outs at Fenway Park. That’s right I’m talking about a makeover on the mound. No doubt the Red Sox pitching staff had it’s struggles in 2012 with a 5.18 team ERA ranked 27th in the majors. However, despite those dreary numbers, the Sox still have a solid nucleus to build around with the likes of Jon Lester, Clay Buchholz, and Felix Doubront. Newly acquired skipper John Farrell has insisted all three starters, and John Lackey, will be back to pitch next season. Granted, Lackey is returning from Tommy John surgery and his performance so far in Beantown leaves plenty of room for skepticism from the Fenway Faithful. That leaves the 5th spot in the rotation open for debate. KG’s reaction to Ray Allen’s attempt at making peace was easily the best part of last night’s game. Would of been great to get win, but the fact that KG stuck it to Ray like this is just great. I wish Doc Rivers did the same. As far as I’m concerned, whatever positive memories I had of Ray Allen as a Celtic died when I saw him wearing a Heat Championship warmup during pregame. No-play-vember: The NHL Lockout remains at a stand-still after weekend meetings failed to bring anything to fruition. So, Boston Bruins fans will have to watch games at TD Garden from the hardwood, not the ice rink. That’s because the league has canceled all of the regular season games for the month of November. The cancellation of games comes as a result of the players union rejecting the most recent proposal from the owners two weeks ago in Toronto. The Beef Between Both Sides: As with most lockouts, the biggest road block between the two sides is shared of league related revenue. The owners (big surprise here) wish to decrease the players guaranteed share of 57% in hockey related revenue. While the players union (shocker) wants increased shared revenue be tween them and the owners, as well as a fixed salary cap that’s not tied to league revenue. Other topics on the table include: free agency rule changes, the elimination of salary arbitration, and limits to contract terms. Cancellations to Continue: With the November schedule axed, more cancellations are reportedly on the horizon. Next up on the NHL Lockout chopping block: both the Winter Classic and the All-Star game could be canceled by this Thursday. It’s likely both will be nixed because neither side will be able to actually meet in New York City, as methods of transportation have been shut down due to the recent “frankenstorm” that struck the east coast. I want to hear from Boston Bruins fans and hockey fans alike on this one. What do you think of the lockout? Do you see it ending anytime soon? Leave a comment. As expected, both Lebron James and Dwayne Wade score in the high 20’s while Lebron recorded his first double-double of the season (26 points, 10 rebounds). 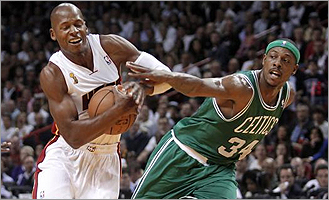 One of the most painful things to watch was Ray Allen dropping 19 points on his former team. Ray played 2 more minutes than Lebron in this game, which no one expected would happen. On the other side, KG struggled for 9 points, but was able to add 12 rebounds. Paul Pierce played amazing in the first half and ended with 23 points while Rondo added 20 points and 12 assists of his own. The biggest surprise was Leandro Barbosa dropping 16 in only 16 minutes while going 3-3 from 3 point range. The newest acquisition already showed that he deserves to be here. The final preseason power rankings are out, and there have been more than a few big surprises in the past few days. Reigning sixth-man award winner, James Harden, was traded to the Rockets to play alongside Jeremy Lin. The Thunder did not want to give him the max deal that he deserved. They instantly dropped from #3 to #5, before even playing a game. The Lakers dropped one spot from #2 to #3 in light of their 0-8 preseason and an injury to Kobe Bryant. However, they still have Howard, Nash, Bryant, and Gasol together when they are all healthy again, and that looks to be a dangerous team. Spurs jumped up to #2 this week, but this may be short lived since Manu’s back has been bothering him lately, and they are a year older. However, everyone should know better than to count out the Spurs. The Celtics jumped from #6 to #4 after they realized that no one in the East can compete with the Heat but us. It goes without saying, injuries will play a key part in this season, with our team getting older. However, we got younger and quicker over the offseason, and are even more motivated this season after coming within 48 minutes of a championship birth. Assuming the Heat are #1 on the power rankings, who do you think should be #2? 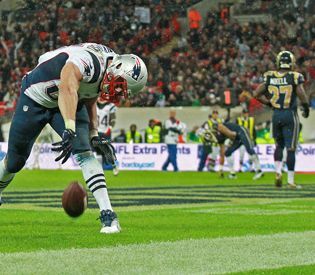 Gronk made it quite clear he wanted to leave a mark in London. Aside from ripping the Rams a new one and making me regret I didn’t start him on my FanDuel team, Gronk made waves on and off the field. Guy simply dominates everywhere he goes. So it begs the question, which London Spike was his best performance? With exception to a few power outages, the Boston Sports Blog was lucky enough to make it through old Sandy as she ripped along the east coast yesterday. Unfortunately for New York, the Miami Dolphins were just the beginning of the storm for the Big Apple and New Jersey. With that joke finally out of the way, our thoughts and prayers go out to everyone down there that’s being affected by the storm. 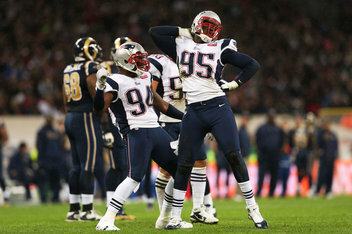 On a brighter note, damn was it good to watch the Pats this weekend. Brady being the Brady of old, the secondary only allowing one long ball into the endzone, and Gronk spiking anything and everything. The Patriots arrived safely home from London yesterday prior to the wrath of Sandy and sit in first place in the AFC East heading into Bye Week. Life is good. Happy Monday Tuesday Boston.